As the final is just hours away, many of the players will be looking to close off any distractions around them and focus purely on the game tomorrow night. The player that is needed more then ever and who will play one of the biggest roles to ensure a win for Milan will be Nelso n Dida. Milan will need him more than ever and everyone wishing on Milan to succeed will be hoping that he can produce a prolific display that he gave Milan in the final four years ago. Dida has been hit with a lot of criticism in years but especially this year. He has been injured for a good part of the season and the time when he has been on the field he has received heavy criticism even causing an angry fan to put him on E-bay to try and sell him. When Dida is good he is one of the best goalkeepers in the world, but when he is bad he is one of the worst, which is sad to say. And Milan and fans around the world can only hope that he remains calm and fully focused the whole game, hopefully pulling out a another great performance like he did against Bayern Munich in Berlin. The rossoneri can't afford any blunders from him or anyone else as it will play a crucial role in tomorrow night's game. 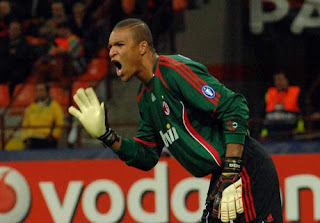 If Dida has a solid game Milan stand a good chance of taking home the champions League trophy once again. A lot of the pressure rests on Dida's shoulders, all is left is for him to remain calm and find his confidence that won him the Champions league trophy four years ago. FORZA DIDA! !